The system is completely enclosed using sheet metal cladding and has one operating window at ergonomic level. The operating window is lockable using electro – mechanical mechanism. Additional sensors provide higher safety to the operator as well as operating system. The system is constructed using precision fabricated pipes, channels and sheet metal and can be customized to suit the customer’s requirements. Retrieving mechanism or platform is fitted to vertical chain loops at four corners of the platform, which give upward and downward motion to the platform. Advanced PLC controller with HMI for numeric display. Quick material retrieval using the shelf number or even the part number. The system rotates in clockwise or anticlockwise direction to select the shortest possible path. Space saving: Utilizes complete height and saves horizontal space up to 80%. Optimum storage capacity: This system allows larger tray dimensions compared to vertical carousel and also varying pitch is possible, allowing storage of material of different shapes and sizes in the same system. Higher load capacity: Shelves are stationary and can be designed for 1MT load capacity (per shelf). Safety of material: Totally enclosed system, avoids damage to material from external influences and protects material from theft. Manpower saving: High degree of automation reduces manpower requirement. Effective inventory control: Material can be accessed only after entering the part number and quantity, in turn ensuring timely update of record. This allows precise inventory control. User-friendly system: Very easy to operate and maintain after a brief training. Smooth operation: Only the retriever is moving up and down with the help of a chain and sprocket mechanism, thus ensuring very low noise and jerk-free material handling. Operator safety: Curtain sensors at the opening window ensure the operator safety during operation and prevent accidents. Emergency switch at front allows instantaneous halting during operation in case of an emergency. Ideal for mid-sized, mid-weight and heavy weight components varying in shape, size and weight. 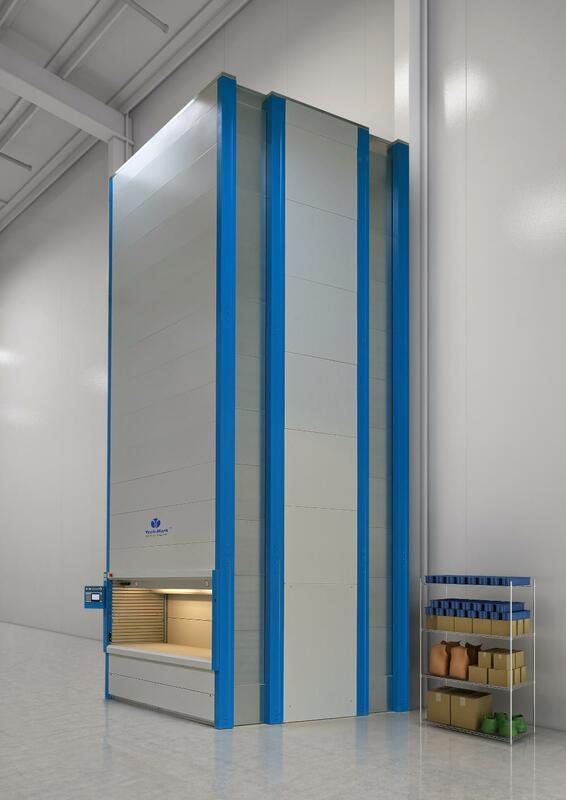 System offers higher flexibility to accommodate a variety of items to be stored. The pitch between two trays can be variable, allowing storage of items with variable dimensions. In this system, trays are stationary while the retrieving mechanism is moving, which increases load capacity per shelf (up to 1MT per tray). The PLC-controlled platform known as retriever is similar to a lift, moves up and down to locate a particular tray while storing/retrieving the material. The desired tray is brought to the operating window located at ergonomic level for easy loading or unloading of material. Very easy to operate and maintain and allows full utilisation of the available height.